Great news was announced at Google I/O today regarding Inbox by Gmail. Open Sign-Ups: Inbox no longer requires an invitation. Now anyone with an @gmail.com address will be able to access Inbox by Gmail. Note, you will still need to "activate" Inbox by Gmail using a mobile device before accessing on the web. 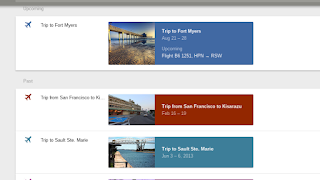 Trips Bundle: Inbox by Gmail will be replacing the Travel Bundle with the new enhanced Trips bundle. The new Trips bundle has been designed to make it easier and faster to get you the necessary information you want when either planning a trip or already enjoying your vacation. The trips bundle will function in a similar way as Stories do in G+ Photos. 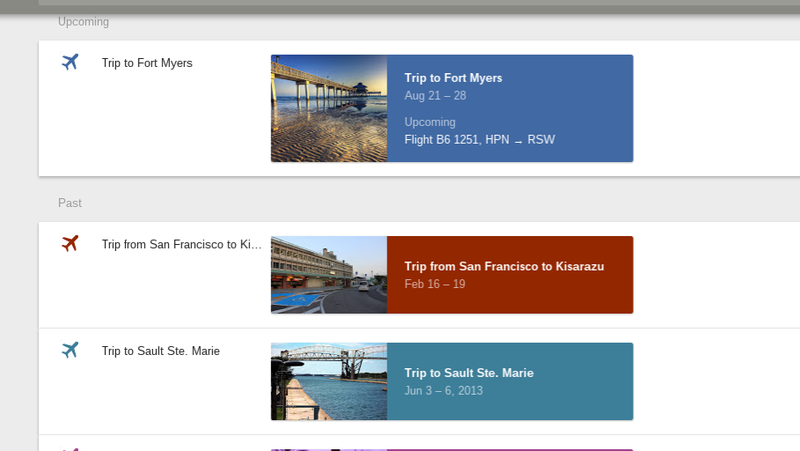 Inbox will group your emails related to a specific trip and will have a “cover” banner. This “cover” bannerwill display the name/location and dates of your trip. When you click on this banner, all of your related emails will be displayed. You can find this new Bundle in the menu under the three horizontal lines on the top left of Inbox. Undo Send: Now, users will have the option to undo a sent email. Users will see two new notifications when sending an email, Cancel and Undo. The Cancel message will appear while the email is Sending and then the Undo will appear after it was sent. The Undo option will appear for approximately 7 seconds. Unlike Gmail, this is not a Lab that you need to turn on, all users will have this option. Redirect Gmail to Inbox: A new setting is available in Inbox by Gmail that will allow users to force a redirect of mail.google.com and gmail.com to inbox.google.com. Please note this feature will only be available in Inbox by Gmail, however you will still have an option to go to Gmail by clicking on “Go to Gmail” towards the bottom of the screen. Suggested Reminders in Emails: Inbox will now suggest reminders based on the content of the email. An example provided by the Inbox team: if you received an email from your friend asking “Can you pick up snacks for the party?” you will see a suggestion under the subject line of the email such as “Add reminder: pick up snacks for party”. It should be noted that this will only be visible to the user and users will have the option to dismiss this reminder. Pinned Main Menu: The left hand menu will now be pinned open all of the time. In addition, the white background has been removed from both the Main Menu and the Hangouts Menu. 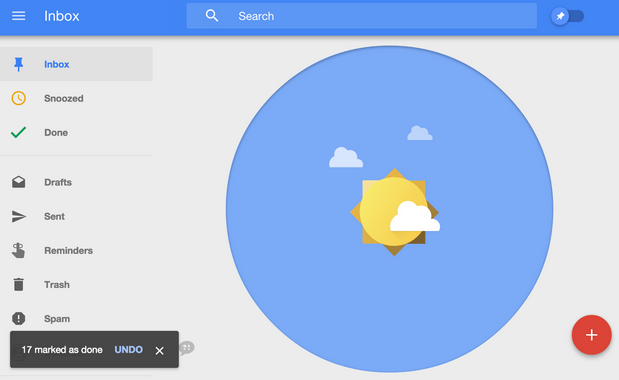 Updated Inbox Zero Graphic: The new graphic will be a sun in a blue circle instead of a sun on an entirely blue background. There were a few other important updates that were announced at I/O, but I felt they warranted their own post or updates to existing posts. These include new delete capabilities, signatures, and keep reminders.